You can add words to the spellchecking dictionary by right-clicking on any word that’s marked as misspelled and selecting Add to dictionary. We just made it much easier to change the sizes of columns and rows in tables. Just click and hold on any of the row dividing lines and drag the line to a different location to adjust the row height or column width. If you want to hide the ruler at the top of documents, uncheck the Show ruler option from the View menu and the setting will now apply to all of your documents. Lastly, we added the ability to copy an existing Google drawing into a document. From inside drawings click on the web clipboard icon and select Copy entire drawing to web clipboard. 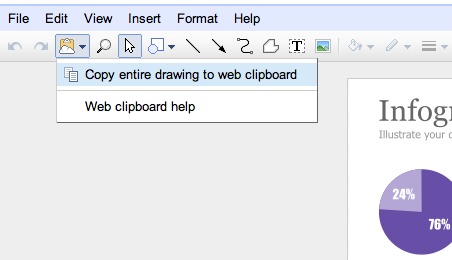 Then, when you’re in your document, you can click on the web clipboard icon again and choose to paste the drawing. 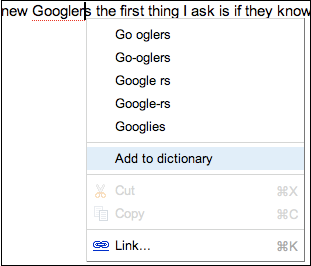 Want to add “Googlers” to your document dictionary? (It is a real word, you know...) Need to resize columns and rows in a table? Want to get rid of that pesky ruler permanently? Wouldn’t it be nice to be able to copy your Google drawing into your documents? You can with a few new small updates to Google documents.